Whether it is a twenty minute stroll throughout the magnificent rain forest to a secluded beach, a tramp to hidden caves, or a venture to old historic sites . . . there is a tramp for you. The Pororari River Track starts at the bridge crossing the Pororari River, one kilometre north of the DoC Visitor Centre. Car parking is available at the bridge. 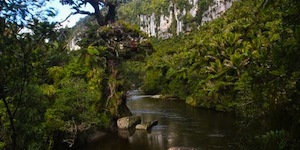 The track follows the Pororari River upstream into the Paparoa National Park. The lower section of the track passes through the Pororari River Gorge – a valley lined on both sides by dramatic limestone cliffs and bluffs towering over the gorge and river. The track passes through a dense sub-tropical forest of coastal broadleaf plants, nikau palms, tree ferns and towering rata. 15 minutes walk from the bridge is a picnic spot and popular swimming hole during the warmer summer months. Bird life on the Pororari River Track includes native Weka, a large, brown flightless bird that has a famously feisty and curious personality. Also Tomtits, New Zealand Bush Robins, native Pigeons, Tuis and Bellbirds. At the end of the gorge, the middle section of the track emerges onto the open Pororari River flats where it intersects with the Inland Pack Track. The Pororari River Track continues across the flatter terrain, following the river until the upper section enters another valley. Suitable footwear should be worn to complete the track. To complete the walk you should allow 2.5 hours return, however, if you’re just out for a short walk, the lower section is very enjoyable for a stroll to stretch the legs. Approximately 12km north of Punakaiki is Fox River and a small settlement, signalling the start of the track for the Fox River caves and the Ballroom Overhang. The Fox River Caves Track follows the north bank of the Fox River upstream across open river flats and through the lush native rainforest. The caves have been an attraction since 1908 when a local sheep farmer installed a toll-gate at the entrance and charged for admission into the caves. Of course, it is now free to explore. Sturdy footwear is essential for the one hour walk to the cave entrance, and also a bright torch – the brighter the better. The last short scramble to the cave entrance leads over slippery rocks so watch your step! 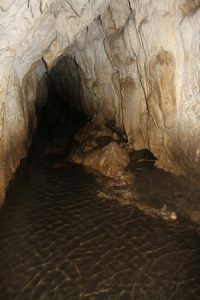 The Fox River Caves are in fact two caves, however the lower and more technically difficult cave is dangerous and only for experienced cavers. The upper tourist cave is beautifully decorated with fragile stalactites and stalagmites and takes about 30 minutes to explore. Take care not to touch or damage the formations in the cave. Rock blocks line the cave floor to walk on and protect the surroundings. Add an extra two hours to your trip and visit the breathtaking Ballroom Overhang, an overhanging cliff face, and a shelter for hikers tramping the Inland Pack Track. The gigantic Ballroom Overhang has a circular back wall, with horizontal furrows carved in it. This shows how it was formed – the erosion caused by flowing river water and is known as a fluviatile cave.